It’s hard to find people who admit they like us muskrats unless, of course, they’re discussing fur coats. For obvious reasons, I really don’t like talking about that much! Here’s what typically happens. Half the people see the photo above and just move right along – nothing good to see here. The other half think I am a beaver and decide I’m cool and industrious until they catch wind of the dreaded “m” word. You would think I have an odour or something. Living with beavers is like living with the perfect sibling – you know who I mean! No matter what I do, the beaver does it better. I perfected the slick-back look long before the 60s rolled around – the beavers do it too but wear it better with their larger, curvacious bodies. I’m a little self-conscious about my hands. Do you think they are too big? Notice my skinny tail is well hidden. I have beautiful teeth – the beavers creatively turned their buck teeth into an endearing smile and an enduring trendy look. Not that there’s anything wrong with buck teeth – just saying. We build small, eco-friendly houses hidden away. While we skulk around in the reeds, the beavers live in the fancy end of the ponds in huge houses. Who knows what all goes on under the mud in those tony neighbourhoods? I am hard working, industrious and work twice as hard as the beaver to find food. They just cut down trees and eat the branches. How hard is that? I will admit to a little jealousy of that huge beaver tail. But do they really have to flaunt it by slapping the water for no good reason? I would never be so vane! Meanwhile I am forced to try to keep my long skinny tail under water so no one sees it. There’s just so much injustice in my world. The beavers and I both have so many things in common. Yet the beaver gets to be a Canadian symbol and I get stuck with a rat in my name. Not that there’s anything wrong with rats – just saying. I need to somehow get the truth out – let the world know that muskrats need a little love too. Love that last shot ~ what a great photo shoot that must have been. Beautiful, active with the animals and just enjoying the serenity. Much like all your shoots I suppose, just beautiful work. Cheers! I’m sure the jealousy of California knows no bounds! It was a great photo shoot in a serene place where I was all alone. My excitement jumped when I figured out it was coming in to shore towards me. Not all shoots work out like this but when it happens, it all seems so easy. It’s good that someone stands up for the muskrats. 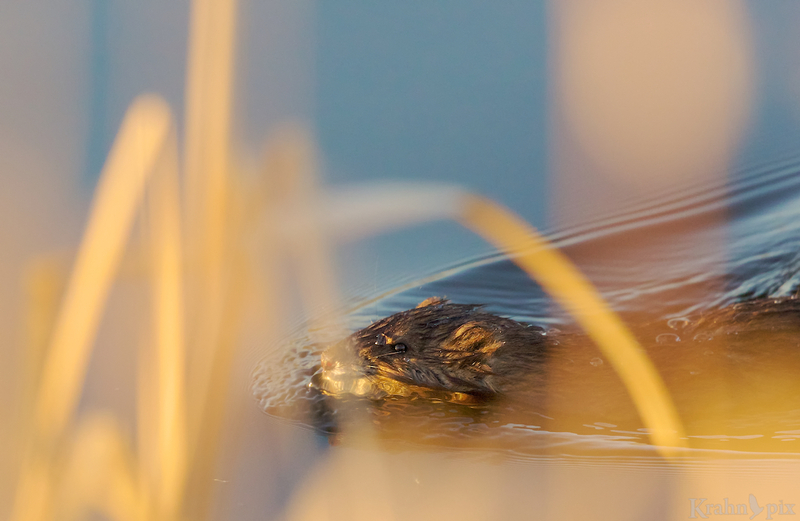 The muskrats probably need a fable to get some love – glad you’ve come on board. The last photo was a special one when I figured out his nose was still in focus. I may not top that. I was so pleased to get the little guy up out of the water. Glad you enjoyed them. I’ve never read anything from a muskrat’s point of view. Nice work! I’m feeling much like a muskrat these days. It isn’t easy. I wish I could tell you I am unfamiliar with the feeling. Then again this post would never have been written. I think you and I should set out to do a major overhaul on names. The only question – would anyone follow? We could start by eliminating the word “Common” from the names of some birds and animals–imagine how much better they would feel about themselves if the had a word like “great” in their names. As for attracting followers for our move to overhaul the names, it would be tough to get most people energized, I fear. Yay! Lets hear it for the muskrat! He is caught in such great light. I enjoy watching them totally absorb themselves in eating the fresh shoots in the spring and how they can get close to the geese without the geese minding at all.For the most part.Quite fun to read. They are almost as eager as beavers! It is fun to watch. Glad this post was fun. Lyle I just couldn’t help it-I ended up shooting photos of a beaver yesterday, just showed up beside my car. I did get some of muskrat , too. Good for you. I love it when they just show up. That’s pretty cool. Nice to see these guys out in action. The only time I see one is hit in the road. I’d definitely agree on this view though I have seen a few of the others this year too. Really cute post, Lyle. You were lucky to get your muskrat out of water too. Tell your muskrat that I saw a beaver today swimming along like nothing bother it and his beaver home was quite a mess. That sounds about right for the beaver:) I was fortunate to catch him out of the water – I’ve watched them a lot and it rarely happens. Yep…Muskrat Love came to my mind right away also. I like muskies just fine. Like you, I am not sure why they don’t get more love…aside from other muskies. Yes that’s probably it! I figured you would like them. It’s nice to see the seasons transition like that. Our snow is mostly gone – it’s early this year. Excellent shots, lovely little guy needs a manicure – he has an elegant presence about him. First shot w/him swimming – gorgeous. Some animal proportions are funny. When these guys are on land it’s even more interesting with that awkward gait from those large hind legs. I’m sorry Ms. Muskrat, but your hands are creepy. A muskrat manicure is in order, I think. Funny. Those hands are a bit off. But don’t let that stop the love! Sono animali poco amati purtroppo e in molti luoghi cacciati per essere uccisi perché ritenuti dannosi. Così vero. La sua più facile andare a caccia di imparare ad apprezzare. And it’s has an important role in life – as somebody’s dinner . . . The interconnectedness of the species is really quite remarkable. Excellent point. I think you are too far north to have encountered Nutria? Occasionally they wander through the farm. From a distance, they can look a bit like beaver. Back in Connecticut I once lived near a pond with a few resident muskrats. I especially love the last shot with the water droplets going everywhere. Classic Krahn! I’m not familiar with Nutria. There’s another one to add to the list. Classic Krahn eh? I like the sound of that (even alliteration). I was pleased that I got that shake. Muskrat, you do deserve better. However, it could be worse. You could be a skunk. That’s the funny thing – no matter how bad it gets, someone has a worse story. It never really makes me feel better. Not sure why. ” ,,, let the world know that muskrats need a little love too.” Really Mr. Muskrat? I see that written and all I can say is stop whining. Where were you in 1976 when Captain & Tennille had a #4 Top 100 Billboard hit with “Muskrat Love”. Okay, maybe you weren’t around, and the Billboard measures sales and airplay in the U.S., but surely you had to have heard of it, even in the less tony neighborhoods of Canada. Think about it dude. You’re golden. How many beaver songs have made it to the Top 100, let alone the Top 10. P.S. Whoever took those pictures of you did an excellent job. Great response. I tried to think of something clever in response but I’ll leave it stand. I appreciate the effort. This is the first post in a while that has had me literally laughing out loud. I love seeing it from the point of view of the star of the post. Will you be posting a rebut by a member of the beaver opposition (I hope)? Always like to hear about laughs on the other end! Thank you. A rebuttal from the beaver – intriguing idea. Now I just need to get some good beaver shots. There’s no question about that. Tough job! Muskrat Love – Captain and Tennille. Say no more. I think of that song every time. I love that cute little muskrat! Makes me think of the Captain & Tennille song from back in the 70’s… 🙂 Then again, I have to be careful saying that because beavers get all the love around here…. it IS the beaver state, after all. It’s a tough balancing act trying to be fair about all this isn’t it? I didn’t even know there was a beaver state! Glad you love the cute muskrat. I’d hate to be alone. Ah, the things you learn from this blogging bit! If you’re interested: http://www.statesymbolsusa.org/Oregon/NicknameOregon.html (all the states have nicknames and official critters of one sort or another). Then again, perhaps it’s not such a great honor to be made the state mascot because your sort were trapped for fur hats. The honour bit is funny. My goodness that’s a lot of critters being claimed by different states.